Wet Walnuts makes me think about lazy summer days and old ice cream makers. I can see someone’s great grandmother scooping out homemade ice cream and topping it with this delicious treat. Fast forward to my kitchen where my husband is standing over the stove with a spoon in his hand, eating the cooled mixture out of the pot. “Let me get you some ice cream to put it on” I said. 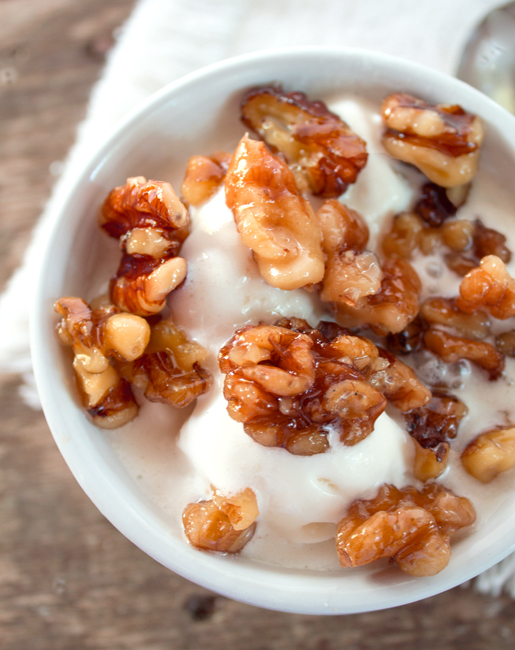 I’m sure you’ll come up with your own imaginative ways to use this very versatile walnut topping. This ones a keeper Kids. Whatever you make it and use it for, your going to love it. Enjoy! In a medium size heavy duty saucepan combine the sugar,corn syrup and water. With heat on medium stir the mixture until the sugar dissolved and the corn syrup is clear. Cook and stir until the mixture starts to boil. Boil for 3 - 4 minutes without stirring. Add the walnuts and vanilla to the pan. Cook and stir until mixture starts to boil, stir constantly while boiling for 3-4 minutes. Remove from the heat and cool the wet walnuts. Store wet walnuts at room temperature. I’d store them in the fridge Judy.